Your formulary is the list of approved medications for which your health insurance will pay full policy benefits. The amount of benefits varies under all policies, based on whether the drugs are generic or single-sourced under patent protection. Naturally, the generic drugs save you and your insurer money, with both parties benefiting from their use. I’ll take the generic every time over the name brand, much as I’ll buy a store brand over a name brand food, except for peanut butter. While I will occasionally buy a store brand peanut butter, there is a remarkable difference in quality between the store brands and Peter Pan, which is smoother, creamier, and more oily, thus far more pleasing to the palette. My belly is just as full with the store brand, but it was noticeably less pleasant in becoming so. I can really live with it either way, but occasionally, I am willing to pay more for Peter Pan. If you take regular medications, you are well aware of what they are, what they do for you, and how they affect you. Since January 1, you are also aware of any changes to your formulary and what you are expected to pay for your medications, since you must meet your deductibles and the payment for your medications likely came straight out of your pocket. Some of them are expensive, aren’t they? What about medications you may need that you do not take regularly? Have you checked them against your new formulary. Your health insurance has a website where you can go and check the formulary for the medications they cover. If you are reading this, you have access to the web and maybe it would be a good thing to check and see if the medications you have needed in the past are listed, that way there will be no surprises and you can discuss with your physician beforehand that those drugs are no longer covered, exploring with him any options for other drugs. In some cases, there are no other effective drugs. I am fortunate and very thankful to be enjoying a remission from my CLL. I am also thankful that my insurance has not changed for the worse, but has actually gotten better under the Affordable Care Act (ACA), since, for the time being, I no longer have an annual limitation of my insurance benefits. I am aware that this can be waived or changed even if it has already been implemented since the ACA under the administration has been very dynamic, subject to the whims of political considerations. From here on in, what I have to say will be of particular interest to those with CLL, or maybe even those with some other type of cancer, particularly those in Mississippi who may have found themselves forced onto the exchanges. I have written about this before, but it bears repeating. If you are healthy, not much of what I have to say will matter, since insurance is only particularly useful to the formerly healthy when their health makes a turn for the worse, whether it be illness or accident, and understand, orthopedic surgery required from a fall in your own home can be very expensive, to the tune of a hundred thousand dollars or more. Our health can turn bad in an instant; if you don’t think so, wait until you try and pass your first kidney stone, which can be lurking without any warning or indication. If you are dealing with a chronic illness or find yourself facing cancer, suddenly, the medications on your formulary are very important, and all the promises of the ACA to guarantee your avoidance of personal financial ruin will only come at the expense of your life. You won’t be financially ruined, but you will likely be dead. Mississippi has two health insurance providers on the exchange…the Blue Cross plan covers the metropolitan Jackson area and the Memphis suburbs which spill over into Mississippi. Those same areas and the rest of the state are covered under the Magnolia Health Plan, which uses only facilities that provide services under Medicaid, placing severe limitations on the number of health-care providers and health-care facilities available to those covered under the plans, whether they are bronze, silver or gold. The different types of plans offered by Magnolia Health Plan are based on deductibles and out-of-pocket expense, not increased access to health-care providers. There are also limitations on the formulary in the plan. Additionally, there are geographical limitations under the plan since you are forced to stay within the designated geographical limitations of your zip code coverage area in order to claim any benefits under the plans. For those with CLL in this part of Mississippi, there is a single Hematologist listed for our geographical area. The options are to use that Hematologist or pay 100% out of your pocket to use another one. I expect this to change eventually as ultimately, if the ACA stays intact, the law will be changed to force physicians and health-care providers to participate. This is already being discussed in medical circles and written about in various opinion columns. You can search for them yourself if you’d like. Physicians don’t like this any more than the patients: they don’t like being forced to participate, nor do they like no longer being able to serve their existing patients. It is vexing to everyone. The real problem comes with the formulary of Magnolia Health Plan, which offers only chemotherapy drugs and treatments now considered to be obsolete for CLL patients. The FCR (Fludarabine/Cyclophosphamide/Rituximab) chemotherapy regimen has been the standard of treatment for nearly a decade. It was developed at M.D. Anderson Cancer Center in conjunction with other participating research facilities that make up the CLL Research Consortium, who work together to develop newer, more effective treatments while searching for a cure. While Fludarabine and Cyclophosphamide are part of the Magnolia Health Plan formulary, Rituximab is not. You will get no Rituximab through Magnolia Health Plan unless you can pay for it 100% out of pocket, and it’s undiscounted cost is about $12,000 per dose. The six doses usually required in a course of treatment mean that this one drug along will cost you $72,000. Earlier treatment methods, which are far less effective, such as Cyclosphosphamide, Hydroxydaunorubicin, Oncovin, and Prednisone (referred to as CHOP) are on the formulary, but it was discovered that this treatment was far more effective if it was administered as R-CHOP, which is the addition of Rituximab. Each chemotherapy drug has a different mechanism by which it works, increasing the overall effectiveness of the regimen, though not without each drug bringing its own side effects or adverse reactions. At one time, the alkylating agent, Chlorambucil was given alone as a front-line treatment for CLL. It, too, is far more effective with the addition of Rituximab. Chlorambucil is hard on more elderly patients and has the unfortunate problem that despite its initial effectiveness, can make patients refractory to further treatment which means not only does it become ineffective, it can decrease the effectiveness of future treatment with other drugs. Chlorambucil is on Magnolia Health Plan’s formulary because is has long since had an expired patent and is available generically. It is cheaper, but far less effective. Fludarabine can be given alone as a CLL treatment, but as indicated earlier, is far more effective if given in combination with Rituximab. Fludarabine, like so many of the other chemotherapy drugs, interferes with the DNE of cells, causing them to not replicate, or to replicate in such a manner as to be susceptible to cell death (apoptosis) by some of the other chemo drugs. All chemotherapy drugs can cause damage to healthy tissues, not just the cancerous ones. 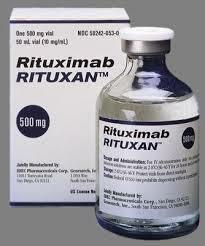 Rituximab, on the other hand, is not a chemotherapy drug, but what is known as a monoclonal antibody. In effect, it is an artificial anti-body synthesized externally in a laboratory (in the case of Rituximab, in mice), than introduced into the body by IV infusion. It targets a specific protein called CD-20 which exists only on the cancer cells, thus, cells not having the CD-20 expression are unaffected. It works like an antibody produced by our own immune system except that it is artificial. It is still protected by patent and is expensive, but extremely effective. Other monoclonal antibodies are also available, such as Ofatumumab, Alemtuzumab, and various other *mab drugs, none of which are on Magnolia Health Plan’s formulary, and all of which are terrifically expensive. Rituximab is not without its own set of side effects and adverse reactions, up to and including death, but every one of the chemo drugs has death as a possible reaction. If you check closely, aspirin has death as a possible reaction. Death lurks everywhere among the living; only the dead are immune. This is where I am headed. If modern, more effective treatments are unaffordable to us under the ACA, what are our options? The answer is hospice care. There is not a doubt in my mind that because of the effectiveness of my FCR treatment I am enjoying this current remission from my aggressive form of CLL. Had it not been for the Rituximab, my unmutated IgVH (Variable Chain Heavy-Region Gene), my ZAP-70 positive status, my elevated CD-38 level, and elevated β2M (Beta 2 Microglobulin) level, none of which are good prognosticators, may have already gotten the best of me. Rather than enjoying this remission, I may have already been reduced to a mere memory. Now, keep this in mind. With our national budget already being strained by social programs which are going to explode exponentially in cost with the retirement and advancing age of the baby boomers, there is nothing our government, yes, our government, the one of the people, by the people, and for the people, would like more than to see me, and you, too, removed from receiving any Social Security and Medicare benefits just as soon as practically possible. The costs must be driven down, or the numbers of beneficiaries reduced, or taxes raised to oppressive counter-productive levels, or all three. Mississippians newly diagnosed with cancer and enrolled in the Magnolia Health Plan at www.healthcare.gov, why waste your time and financial resources trying to prolong the inevitable? 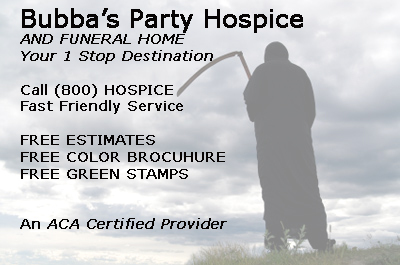 Call 1(800) HOSPICE today for a free, exciting color brochure, and peace of mind. Think not? Just remember, things are not what they seem. We have not yet seen the establishment of the ACA’s Independent Payments Advisory Board (IPAB). These are exactly the sorts of issues the board will decide on our behalf. We must expect the decisions to come down to a cost/benefit analysis, with others deciding the cost and the benefits. The beneficiary will ultimately be society which can no longer benefit if we cannot contribute to it in a fiscal or politically meaningful way. It is a brave new world out there. The coming black market for drugs will not be for cocaine, heroin, or methamphetamine. The drug dealers of the future will have Rituximab, Arzerra, Humira, Enbrel, and a host of others (listed HERE) that promise much hope of a meaningful life to so many. Some of them are human synthesized, some mouse synthesized, and some are new Chimeric Antigen Receptors, which be synthesized from our own tissues, grown in a lab, and reintroduced into our systems as replicating antibodies that will destroy the cancer, or the Multiple Sclerosis, the Amnio Lateral Sclerosis, the Lupas, and a whole host of other diseases. These exciting new drugs could provide permanent cures to so many diseases. And they will not be inexpensive. And they will not be in the formulary of The Magnolia Health Plan. If Rituximab is not in their formulary, having been the standard of care for a decade, when, I wonder, will they catch up? In the meantime, if 1(800)HOSPICE is not your desire, leeches and other forms of bloodletting, and heated glass vacuum spheres to pull our the various offensive humors from the body, along with laxatives, are all available to you, the consumer of modern medicine. They are cheap, even if they are also not covered by Magnolia Health Plan, and nearly as effective as some of the treatments that are listed in their formulary. Life is a treacherous business, fraught with peril the whole way through. Any medical issues discussed herein are from the point of view of a layman. I am an expert patient…not an expert health care provider. Discuss formularies and health care options with your own physician –earlier not later. Opinion is not fact, so form your own opinions from your own facts, please, or feel free to borrow mine at your own peril. If I have missed something despite the most arduous searches, please, Magnolia Health Plan, show me where I am wrong and I will publish it here.